Company: Serrasalmus nattereri (Redbelly Piranha) should be kept in a species aquarium and they can sometimes even be hard to keep with other of the same species. Aquarium setup: Serrasalmus nattereri (Redbelly Piranha) requires a large well filtered aquarium. The aquarium should contain a number of large plants such as Amazon Sword plants as well as floating plants to dim the light. The aquarium should also contain roots and rocks that create hiding places for the fish. Serrasalmus nattereri (Redbelly Piranha) prefers an aquarium which is hit by sunlight. Feeding: Serrasalmus nattereri (Redbelly Piranha) should be fed live food. 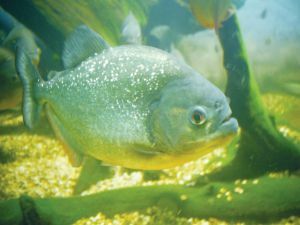 Breeding: Serrasalmus nattereri (Redbelly Piranha) can be breed in aquariums.